With the success and fun we’ve been having with Elsa, our German Shorthaired Pointer, I began dropping not too subtle hints to my wife that Elsa needed an equally energetic companion. I was not all too surprised that she wholeheartedly agreed. I knew that I wanted another pointing breed with a similar structure as Elsa (deep chest, flat coat) that could work with her in the field, but did not want another GSP – it also had to be male. This narrowed breed options down to the English Pointer, Vizsla and Weimaraner. We strongly considered a rescue, but wanted to ensure a smooth transition and have influence over the training process from the start. 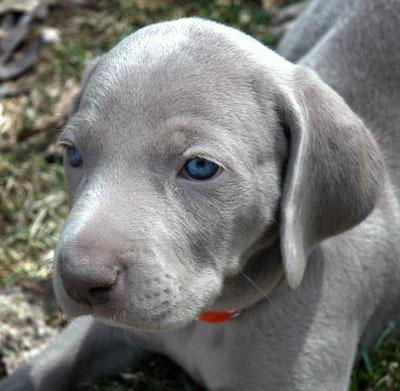 I have always been intrigued by Weimaraners given their striking appearance, size, and reputation. Fortunately for me Chris Conklin, the State Coordinator of the Michigan Weimaraner Rescue organization and co-operator of Celestial Weimaraners lives close to our home. After contacting Chris, she had indicated that her and co-owner Linda Swanson’s female Kya recently had a litter of pups and they had an available male. When reviewing the Sire and Dam’s backgrounds, it was hard not to be really impressed! I stopped by Chris’s home on March 28 to check out the litter, drop off an application, and spend time with the available male puppy… before leaving I wrote a check for the deposit. Below is Kya getting a kiss from our new puppy. Our new guy, who at the time was known as “Mr. Orange”.